Around 1,000 homes in the Dungannon district are currently without electricity due to the severe weather conditions. 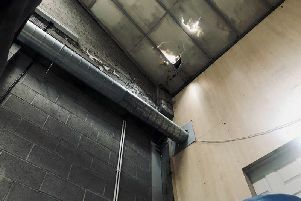 A Northern Ireland Electricity spokeswoman said: “NIE’s local incident centres across Northern Ireland are open and NIE emergency crews and engineers are responding to faults. “Damage has been caused by flying debris and high winds, including broken electricity lines and damage to poles and other equipment. “There may also be further faults which have not yet been reported to Northern Ireland Electricity and adverse weather conditions, which could cause additional faults, are due to continue for the next few hours. “We would like to remind customers that if they do lose electricity supplies they should contact the NIE Customer Helpline on 03457 643 643 or report the fault online at nie.co.uk. PSNI have received reports of numerous trees also down in the district specifically on the Ranfurly Road, Dungannon and also Annaghmore Road, Coalisland.